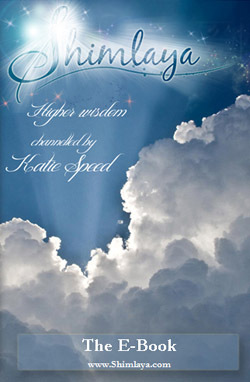 Katie has a powerful ability to connect with beings from higher realms. She is able to connect with her own guide Shimlaya, from the Master Realms, to bring you wisdom and guidance. She also offers a service whereby she connects to your own angels and guides and channels a written reading for you. Whichever method you feel drawn to, the guidance you receive is sure to be comforting and often life changing. See Katie’s explanations below of these different methods of channelled readings. Spoken channellings are an opportunity for you to ask Shimlaya ask any question you have in any area of your life. We harmonises energies while I ‘step back’ enabling Shimlaya to gently speak through me directly to you. As well as answering your questions, Shimlaya may speak about untapped abilities that you have and/or past life’s that are influencing your current life experience. To arrange your reading, please email your Skype address and times you’ll be available. I’m happy to go over any initial question you might have about the process before your reading begins. Written channelled readings are very much like letters of love and wisdom from the higher master guides and/or angels that are with you. They are full of insight and guidance on which ever subject you are currently concerned with. For your reading I’ll easily connect with them so that they can speak to directly to you via written communication. As an added extra I’ll also be open to receive any other messages that come through for you.